New Delhi : Prime Minister Narendra Modi on Saturday digitally launched the Reliance Foundation Youth Sports initiative pan India, kicking off nation’s largest multi-city, multi-sports school and college sports competition. With the official launch, Reliance Foundation will invest in building a culture of sports in schools and colleges to unearth the vast and untapped talent in our education system. RFYS will promote and inculcate multi-discipline sports avenues among the youths of India. 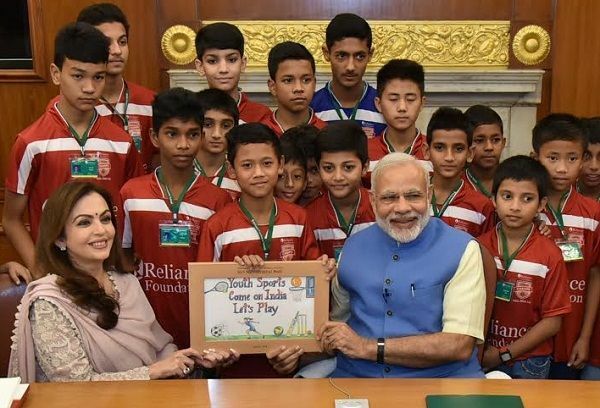 As part of the digital launch of RFYS initiative, PM Modi along with Nita Ambani, Founder & Chairperson, Reliance Foundation and Vijay Goel, Min of Youth Affairs & Sports were connected from New Delhi through live broadcast, simultaneously to eight sports grounds at Kochi, Chennai, Goa, Mumbai, Delhi, Kolkata, Guwahati and Pune. The PM interacted with the school children and watched the RFYS football friendlies played among schools to mark the launch of this initiative. Modi called the nation to “Let’s Play” while hailing the initiative as a unique step in promoting culture of sports amongst today’s youth. Reliance Foundation Youth Sports initiative is in sync with the Government of India, Ministry of Youth Affairs and Sports’ vision ‘Khelo India’ to bring together a unified and professional system in India to develop sports, players and a sporting ecosystem.